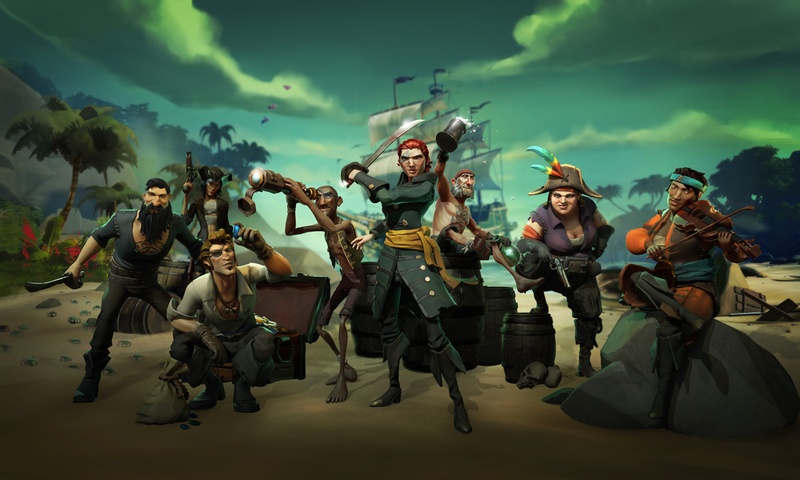 Sea of thieves as you should know by now is a shared world adventure game developed by ‘Rare‘ and published by ‘Microsoft Studios‘ is one of those games that has a lot of potential. The developers, have done a very good job with this game and there are million of players currently. As we hoped, they didn’t stop there. More has come to Sea of thieves. Now the only update that has yet to come is the Forsaken shores. We are only just talking about these different updates. Most of the new stuff has already happen by now. The cursed sails was the second and is most likely the more obvious of the three. Basically some undead crews are also roaming the seas. 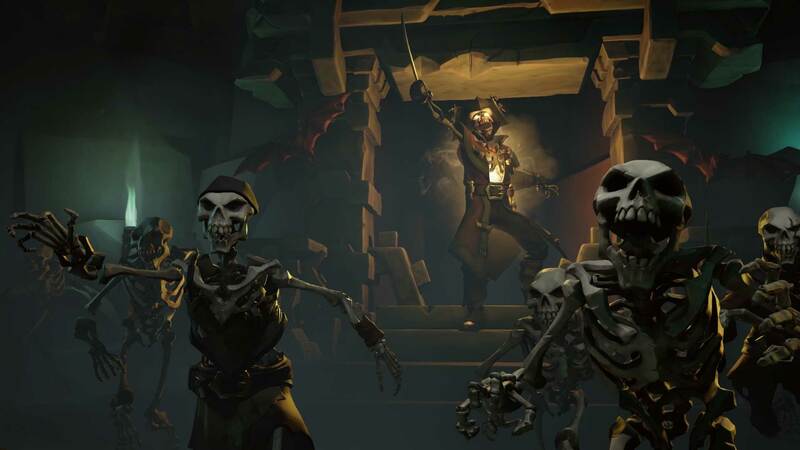 This is the one of the things we mentioned in our first G-blog about Sea of Thieves we were hoping for skeleton crews who are hard to kill to sail around and give some players a serious run for their money… or should we say loot. Sort of like Captain Barbossa in pirates of the Caribbean, curse of the black pearl. Cursed sails also brought in a new alliance system and a new ship type. The skeleton battles was a temporary thing but we hope they bring it back. The newer one that most are talking about is the forsaken shores. This update is suppose to be available the 27th of September. Forsaken shores opens up a region called there devil’s roar. Now this area is friendly nor is it safe. There are rocks being launched from volcanoes which can destroy your ship and you along with it. There are geysers which naturally you do not want to be near when they activate and thanks to all that heat and fire, some waters are too hot for even the toughest pirates to handle, especially when it’s superheated. Those are just some hazards, so expect more. It’s quite obvious that the developers are working hard to make Sea of Thieves a major game. One update that got a lot of players excited was the hungering deep. A giant super shark basically that hanged out at a certain location and when conditions are met, it shows up to battle pirates. It was huge, intimidating and many didn’t know what to do about it. When you look at all these things and everything else in Sea of Thieves you can see the potential. We at X35 Earthwalker have many ideas and we hope they have the creativity that we have and get some more big exciting stuff out there. 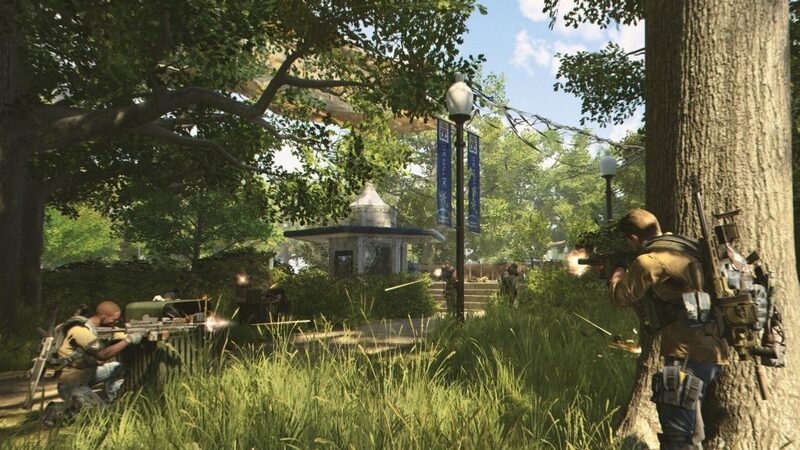 Generation Zero is the new open world action game developed by ‘Avalanche Studios‘. It is coming out in 2019 on the Xbox One, Play Station 4 and PC. There is a beta as well which players can sign up for. 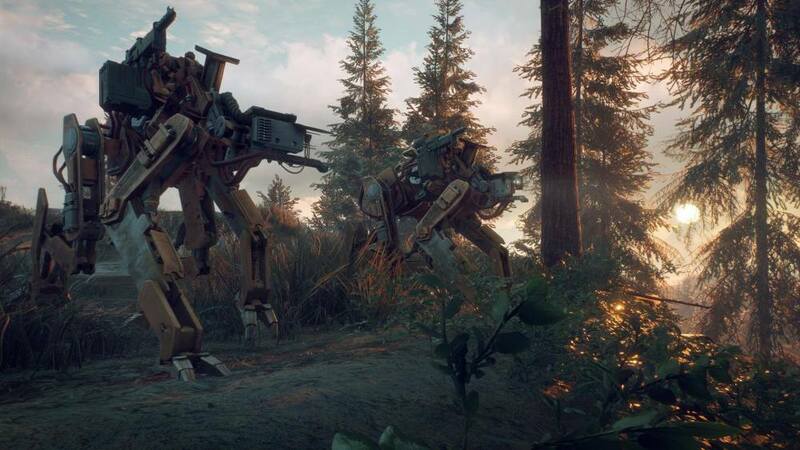 Generation Zero has gotten the attention of some gamers. Let’s take a look. 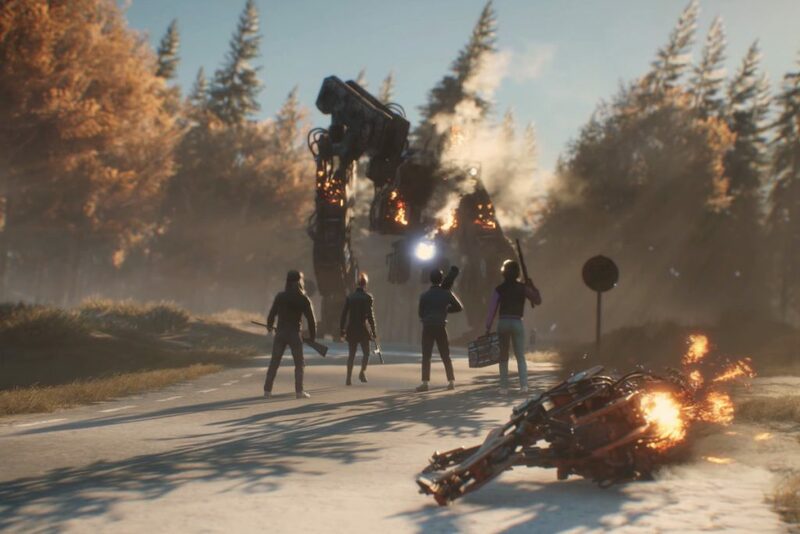 Generation Zero is set in Sweden in the 1980’s but obviously reimagined. Poor Sweden, because the countryside has been invaded by some very dangerous machines that will attack on sight and attack with force. Off course with games like this, there is always a big mystery to figure out and solve. Why is all of this happening? What’s with these machines etc. 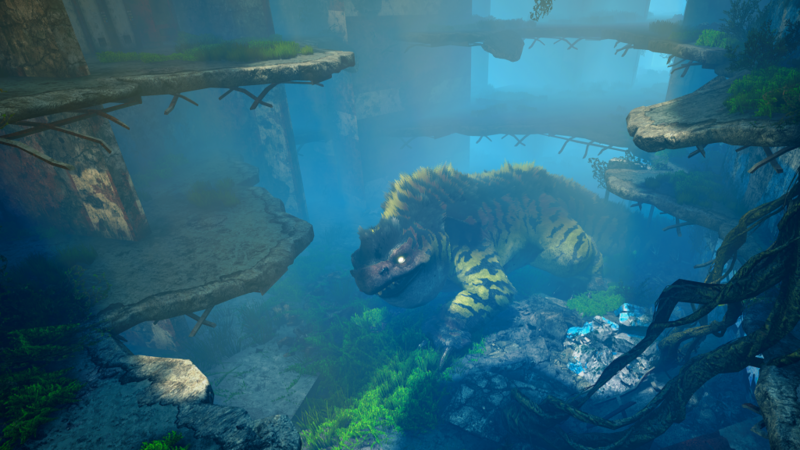 The gameplay style has been described as cat and mouse. This instantly tells gamers that running out there spraying all your weapons at the enemy is a bad idea, since the players will in this case be the mouse. Players will be wise to fight by strategy and stealth. 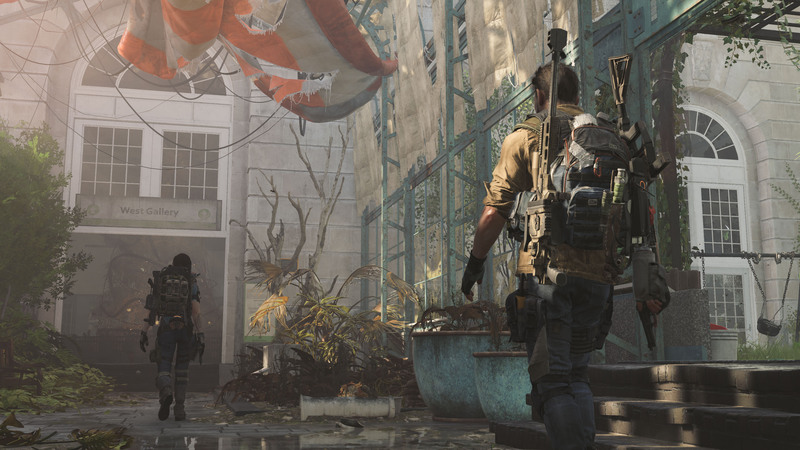 Players can lure enemies to certain spots for an ambush, distraction or to shoot a barrel or something lethal next to them. There are multiple options in Generation Zero. The enemy is the machines. There are different types of them too with their own functions. Ticks are the smallest but have got some movement going on. They will try to get close to slash you and off course blow up. Seekers who act like scouts/snitches. They will alert other machines of your location, so take them down fast or hide. Runners are a problem, they are fast and in groups. They will take you down with their automated weapons and even try to ram you over. Tanks are the big ones who have missiles and big guns. They are heavily armoured and a major threat. Come with a plan or die. 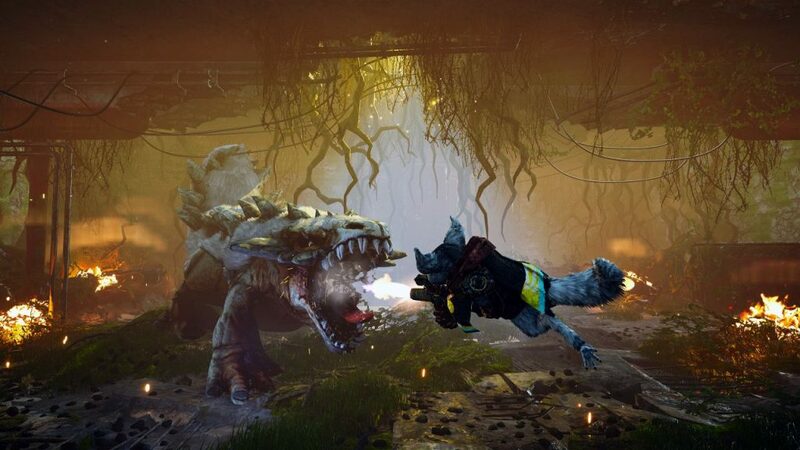 Each enemy isn’t just copy and paste or spawn and Respawn in Generation Zero. Each one has their own mission and task to complete. They roam about in certain ways. So when you encounter a specific enemy and let’s say destroyed one of its components, like weapons, armour etc, that damage stays. it is permanent and will still be there if you happen to run into that same machine enemy again. So let’s say you met a powerful enemy which you don’t have the means to beat but you can weaken it, well next time you see it, that enemy will be much easier to beat. 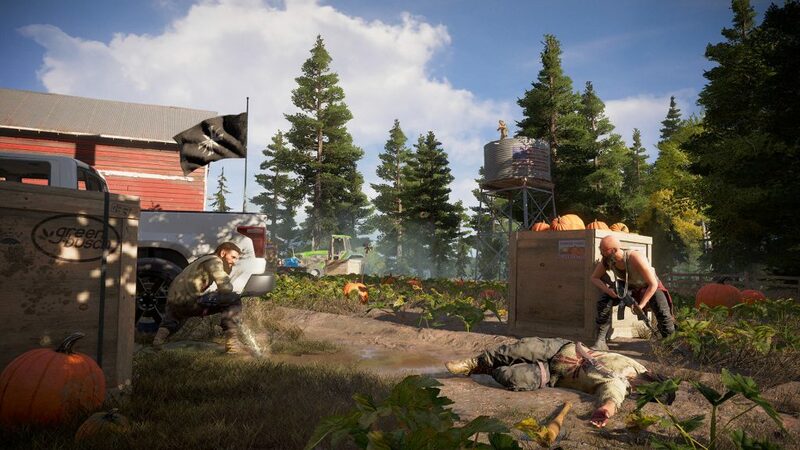 So players in Generation Zero have to destroy the machines, stay alive, look for equipment and items that can really help, get better weapons and solve the mystery of what happened here in 1980’s Sweden. Best of all is that Generation Zero is also multiplayer. That’s right, 1-4 co-op multiplayer. So you can share loot with allies which is a feature something Destiny 2 should of had. Revive downed allies and use your skills to your advantage. 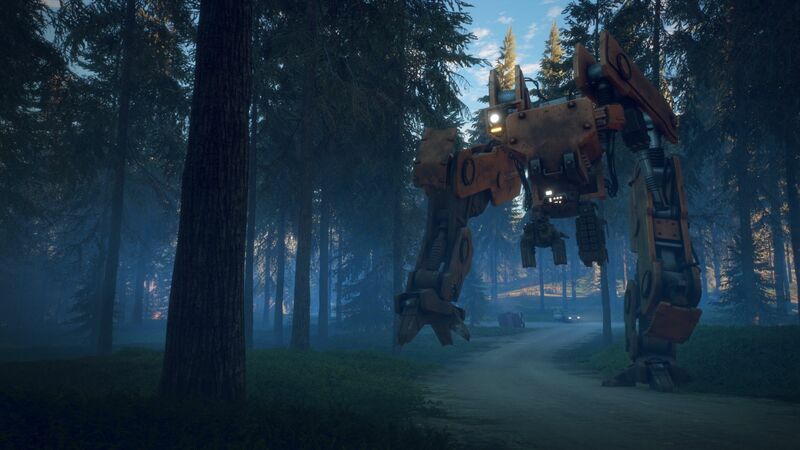 We checked out some gameplay and Generation Zero looks good right now. The machines have some variety to them and function differently. The full day and night cycle combined with the different weather you can get is a nice touch and does impact certain aspects. There are simulated ballistics 1980’s style music and good graphics rendered with the Apex Engine. We just hope that this game doesn’t become too easy, especially when playing with friends. 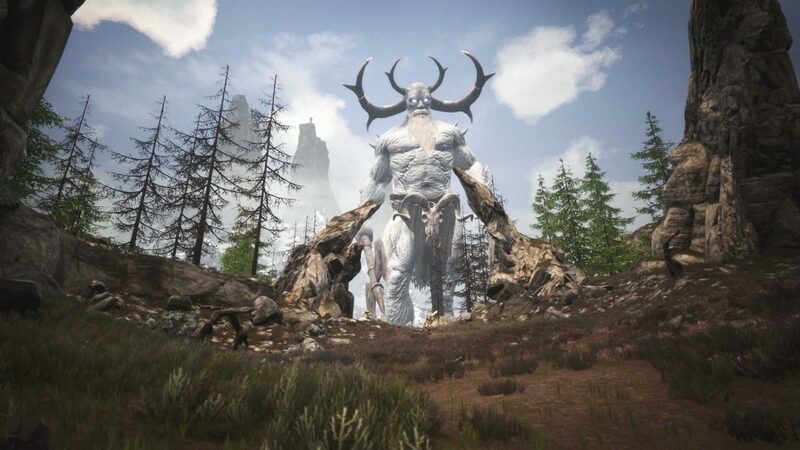 Conan Exiles is a new open world survival game developed by ‘Funcom‘. It’s coming out the 8th of May on the Xbox One, PS4 and PC. 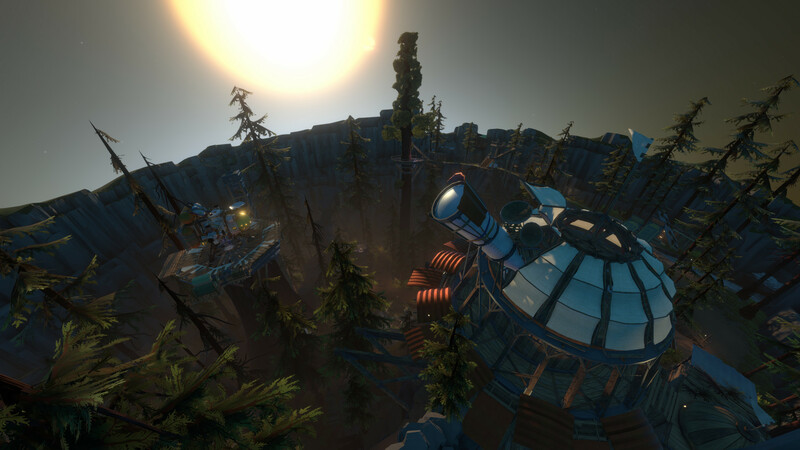 A number of eyes are on this survival game. Let’s take a look. Now many have grown up hearing about Conan the destroyer, whether the character or film. It was quite an interesting world with it’s creatures, people, magical abilities and items. Now here is Conan Exiles. 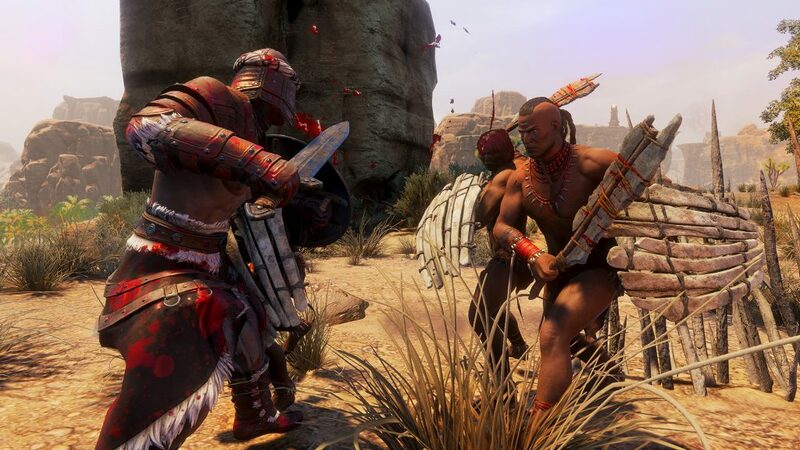 This open world survival takes place in a barbaric wasteland. Sp straight away we know survival is going to be a problem because wastelands tend to not have much around. In this game players control their own character in an attempt to survive, fight and build in this deadly world. So to some extent this is like Minecraft but more brutal. Now this wasteland isn’t empty. There are many secrets dark ones and many ancient ruins of ancient civilisations. This world is in fact quite rich with many things to do and explore. You start with literally nothing but the end game is the exact opposite. Players could end up with large fortresses and literal cities. Yes, character progress in Conan Exiles goes that far. This game is actually quite merciless. The stuff you do here are truly barbaric. For starters you can torture bandits (and other bad guys) until they submit and become your slave by tying them to the wheel of pain. You can even sacrifice the still beating hearts of your enemies to your god on very dirty and bloody altars (about as pagan as it gets). This is some dark stuff but in the fictional world of gaming… we like it. Charge into full on wars, battle monsters and dangerous creatures alike, harvest materials and gear up to traverse the barbaric wastelands. Survival here isn’t just simply eating and drinking. Nope. There are dangerous weather conditions to deal with like a scouring sandstorms. 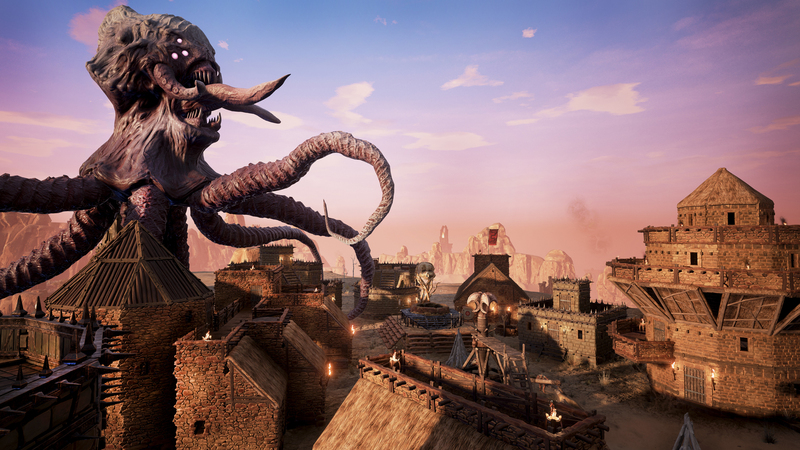 Conan Exiles has some real secrets going on and one them is a serious problem. Players must protect their characters minds from being corrupted which will lead to insanity. If you want epic though then check this out… you can summon the avatar of your characters god and watch them completely destroy your enemies before you. Now that’s incredibly scary. Everything is explorable from those ancient looking runes all the way to the sand dunes over there (pay attention). 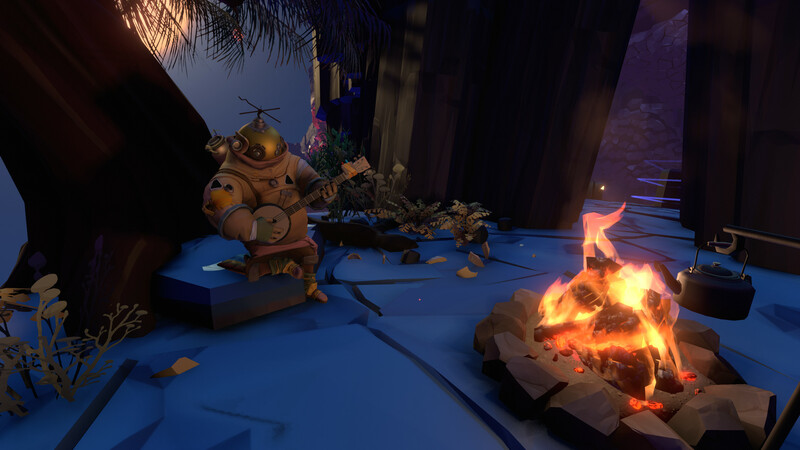 While exploring, do not forget to harvest materials which can be used for crafting weapons, items and more like armour, clothes and equipment . Use those materials also for the building of your home, then camp, them, base, then fortress, then kingdom. Some ruins are more dark and scary than others, that’s probably because they hold secrets to what happened to the civilisations before you, what lead to their end and more dark secrets and good knowledge. Oh and those gods we mentioned earlier that you can summon… yeah we can control them directly! Those bad guys that you can capture and torture aren’t just for entertainment. You can put them to hard work. Get them to be your army for when you attack other places or you can make their job crafting and other useful stuff. The battles are serious business. You can destroy the place and actually see structures crumble due to explosive or great force. The developers claim that we can see heads rolling and limbs flying which would be real cool actually. We hope they pull it off well. Conan Exiles is also has the option of multiplayer. You can play alone locally if you want or take the survival to another level dealing with real players in the same server or like Minecraft have your own world and invite some friends over where you have complete control and so can stop people from stealing from you. We checked out some gameplay and we can say that Conan Exiles is looking real awesome. You can hunt normal animals like elephants for ivory (poor creatures) as an example but there are some things out there that can only be killed in specific ways like silver arrows or weapons. Some you must hunt alone in the dark, at night. That’s cool. 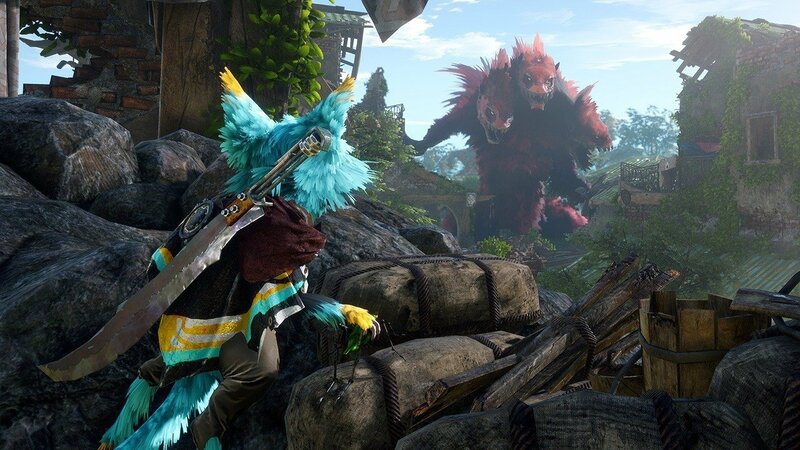 This game definitely reminds us of ARK: Survival Evolved. So what do you do if your on a online server and another player summons and sends a god avatar after your base? Well… the short answer is run for your life (women and children last!). 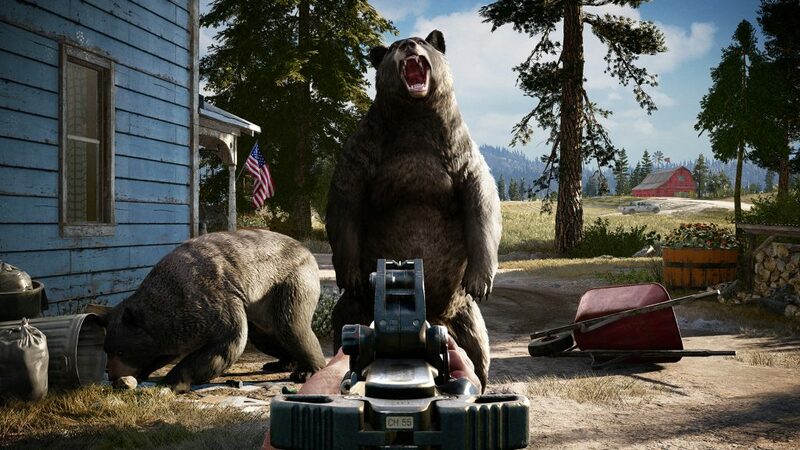 Far Cry 5 is a action adventure open world first person shooter game and is the fifth main title in the Far Cry series developed by Ubisoft Montreal and published by ‘Ubisoft‘. It’s coming out the 27th of March on the Xbox One, PS4 and PC. Now apparently there’s a new prophet in town and already we can declare that he’s a false one. Let’s take a look. The story here in Far Cry 5 is very simple. Basically a false leader called Joseph seed rose to prominence. He’s believes he’s a divine leader of some sort but the truth is, that he’s a radical preacher who uses gun, intimidation, violence and more to control and keep the people in line. He established a congregation which he named ‘Eden’s gate’ which is a militaristic doomsday cult. The residents of Hop county have had enough and formed a resistance and here is where the players get involved. Players control the sheriff’s deputy who is going to arrest Joseph Seed. Joseph isn’t alone though. He has the ‘Herald’, sounds fancy but they are just literally his family. 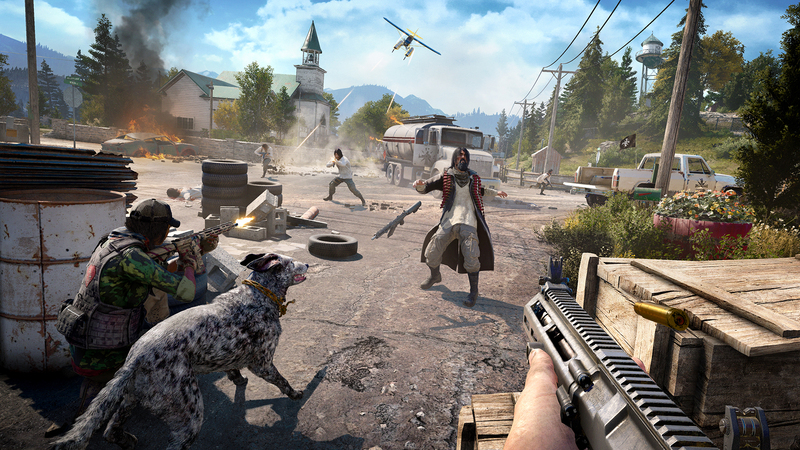 Now Far Cry 5 is said to be the biggest Far Cry game yet. The game put a lot of focus in making sure players get as much freedom as possible. Players do not have to take on Joseph alone because the campaign is for two player co-op as well. So grab a friend and a rifle and cause some mayhem. What? You thought it was just guns? Nope. You can hire people to fight with you (guns for hire and even hire animals apparently. We heard that you can get more than a dog to help you out. Some have even got a bear to help them out in combat. Can you imagine firing at some resistance members when all of a sudden a bear comes out of no where and starts mauling your friend on the right? So what do you do? Far Cry 5 A.I’s isn’t as straight forward as other games like Saints row and Grand theft auto. If you strike the enemy real hard then the enemy will strike back just as hard. If you become recognised as a real threat then the cult will seriously amp up their defences and efforts to take you down. 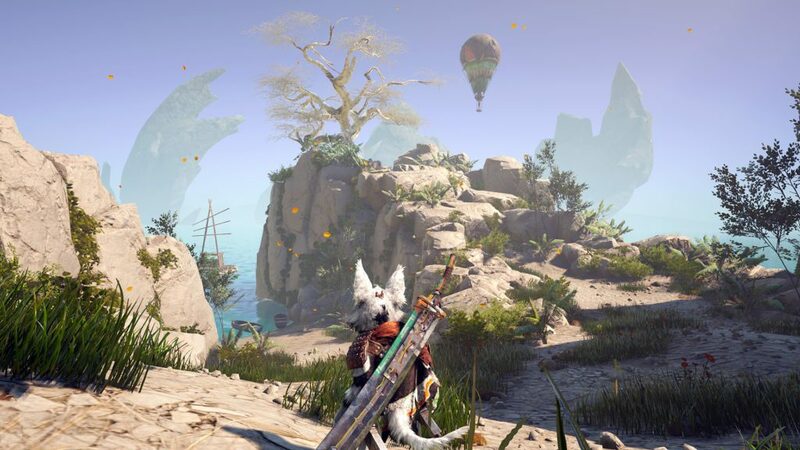 Now that sounds scary but we at X35 Earthwalker have yet to see a open world action game like this where the enemies are not a joke. The cult should have the advantage with better and more weapons and people to fight so it should be done in a way that taking on the enemy head on is just suicide. Maybe have a mission where stealth is strongly advised and if they do get caught reinforcements will show up and when they do it’s pretty much game over because of how overwhelming they are. At least make it clear that Eden’s gate is a true threat. Now when it comes to weapons you certainly ain’t short of them in Far Cry 5. Expect weapons like the: MBP .50, MP40, Compound Bow (that’s ours), AR-C, Grenades, dynamites, melee weapons like a baseball bat, pistols and much more. It doesn’t stop there. You will find vehicles in this world too, like: Coupe, Tractor (why not? ), pin up trucks, hydro planes, helicopters and even a 18 wheeler widow maker. 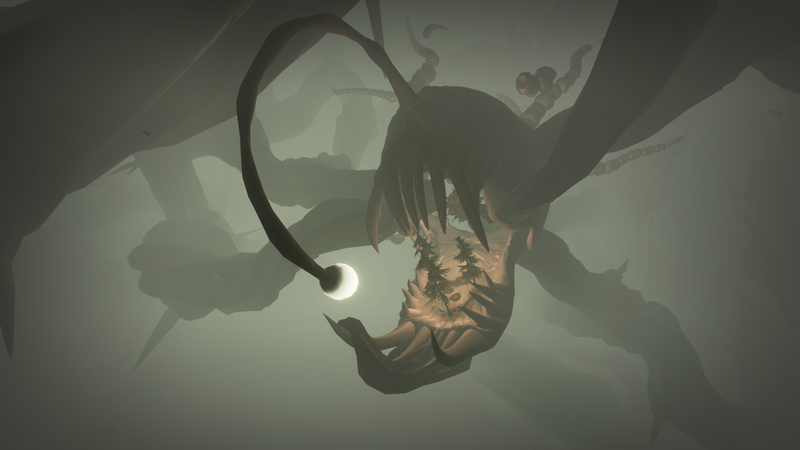 Off course there is much more in a game as big as this so exploration should be your thing. 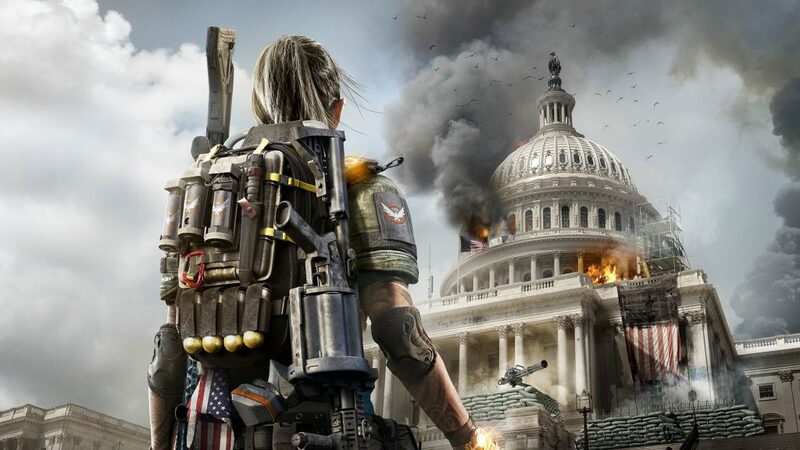 Make sure to take time out to go and find these weapons, conquer side missions, build the resistance, hire some guns and off course have a good time taking down a false prophet who is blinding and hurting people. We checked out some gameplay and we saw the stealth side and the action side of Far Cry 5. When it’s action the game feels sort of like Saints row with enemies coming after you and just firing. You can with some cover mow them down. While when it comes to stealth things like deciding who to eliminate first and when to move and hide the bodies add extra layers to the mechanics. Overall the combat is sort of what we expected but we hope to see how the whole the harder you strike the harder the enemy strikes mechanic come into play. Over from that, there isn’t really anything special about the gameplay. Sure there is much to do when you actually start playing but we will see when it come out. Sea of Thieves is a new open world multiplayer pirate life game developed by, ‘Rare‘ and coming out 20th of March on the Xbox One and Windows 10. Sea of Thieves is a very large game with lots going on and lots to do. All about exploration and adventure. Let’s take a look. In Sea of Thieves gamers get to live the pirate life. As in cutlass, drinks, shanties, scaly wags, bar wenches kind of pirates. Straight away it’s clear that it is a multiplayer game but you can be a legendary solo pirate or a powerful pirate crew. Grab your boat and head out to sea. The world is very large with many islands to discover and explore. The ships can be fully interacted with. You can raise or lower the sails, raise or drop the anchor, control the helm to steer the ship, go up into the crows nest and be a spotter. The sails actually have an effect, to raise the anchor you need to literally turn the wheel yourself to slowly raise it up. Also the crows nest is important as spyglasses are in this game and can be used to see other ships from a good distance away giving your time to decide what actions to take. That’s right you aren’t the only person in this game. There are countless other pirates and many pirate crews who are all about building their reputation as well. Are they friendly and want to socialise or do they draw their cutlass and flintlock pistols and want a battle? Be careful though as cannon balls do what they should do, which is damage and cause water to fill up in your ship meaning you need some crew members to get rid of the water and patch up the holes in your ship but that means their are less hands on deck to fight the attacking pirate ship. So crews must work together to handle battle. There is so much more to this game then originally believed. There are a bunch of other NPC characters who have their own reasons goals for being in the sea of thieves so make to check them all out. It’s important. There are trading companies like the the order of magic who want to control the ancient and magic of the pirate world, the merchant alliance who’s goal is to control and handle trade in the seas and Gold Horders who are all about the treasure. Each of these trading companies are essential for building your reputation and making progress. Players must decide what trading company they want to be affiliated with because each one represents a certain play style. So what is your pirate crew about? Are you the riches pirates who can buy all the rum they want, are you top level business pirate men who buy and sell or are you a cursed pirate crew like Barbossa from pirates of the Caribbean who deal with magic? It’s actually cool when you think about this way. As you build reputation with them, you get promoted within their ranks and get cool items and titles for you to show off and prove how far ahead you are. So take on their favoured activities and voyages. As you make progress they get much harder and more mechanics to take into account. Since Sea of Thieves is a game all about pirates that means you can have or be part of a crew. This means multiple pirates on a ship. Each crew member has their own voyages and personal progress in the sea of thieves. Crew members can propose voyages to the whole crew and so the team can, as a team can decide what missions to go for. This also means some players have voyages that others won’t have so having them in your crew is an advantage. So having a player who is much ahead of you in terms of personal progress is actually a good idea because they will have bigger and more difficult voyages and that’s a good thing for your reputation. Remember that voyages are based on your reputation with trading companies. There are no barriers in place concerning players playing together. 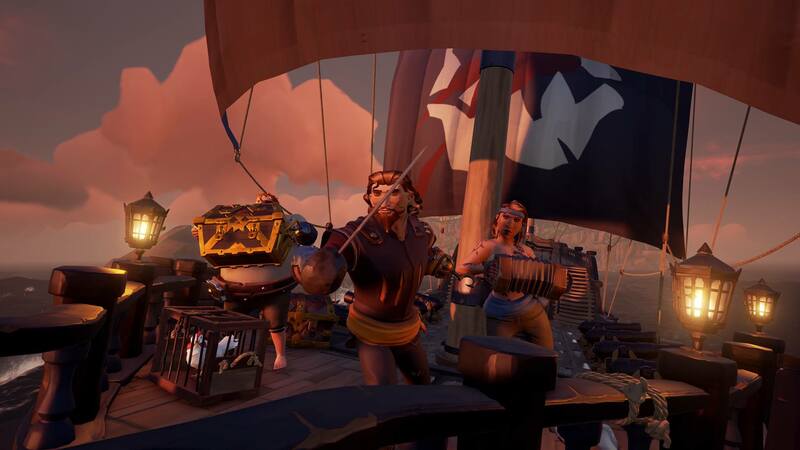 The most challenging voyages can be accessed by your lower progress friends meaning you don’t to wait for your friend to be a level 100 for example (no levels in sea of thieves). This is also means you won’t have to worry about running into too powerful enemies. it all comes down to how you use your weapons. There is the guns and blades. With the guns it’s just a matter of landing your shots, you all die just as fast. With the blades, you have to know when to block players attacks and when to actually strike back. There is actually some skill gap here in terms of combat so make sure to get some practice in. If you thought that other pirates was the only threat on these sees then boy are you mistaken. Remember how some are interested in the magic and ancient of the Sea of Thieves? Well on some islands there just happens to be some skeletons who walk around and wield weapons as well. These Skeletons are not here to play, they can hit hard and even block your attacks. They also do not fight alone and will come in numbers to defeat your crew and keep you off the islands and away from treasure. If that wasn’t enough, skeletons don’t really die do they? Skeletons seem to keep coming over time, after all they are already dead. It’s pretty much like fighting the cursed crew of the black pearl from pirates of the Caribbean. There is more. There are sharks that inhabit the waters so falling of your ship or being blasted of by a cannon is the last thing that you want because we heard it takes two bites from a shark to kill you and they are off course faster than you. It gets worse, even the weather is against you, there can be storms which will make you lose control of the ship, make you crash and even send you way of course. Worse a lightning bolt might strike your ship which will cause real damage. It has been hinted by the developers that there are more threats in the Sea of Thieves so be on your guard and don’t get caught “unprepared and unawares”. Sea of Thieves do have other things to take into account. For example if you and your crew are on a voyage and go to a island, you drop the anchor and head on to the island. The problem is that your ship is sitting there alone unguarded. So what if another pirate team came along and saw your ship, two of them climb on board, raise the anchor and then they leave with both ships and your crew is left with the treasure on an island with angry skeletons on land and deadly sharks in the sea. What do you do now? We believe there is some sort of respawn system that brings you back to your ship, so there is a chance to get your ship back. We checked out some gameplay and it so far looks like a top level game. The art style works well with pirates. the graphics are very good and the sounds are excellent, especially when you use the instruments to make good pirate-y music. We like the acceptable level of interaction like dancing, music and even drinking, which by the way actually gets your pirate drunk meaning blurry and moving vision and harder to control and throwing up (all included). Sea of thieves will also be enhanced on the Xbox One X Sea of Thieves isn’t a released done and finished game. It has been explained that it’s a ever growing game and that new features and adventures will be added after launch continuously. This makes us at X35 Earthwalker wonder what else they could put in. There is a lot of opportunity here. 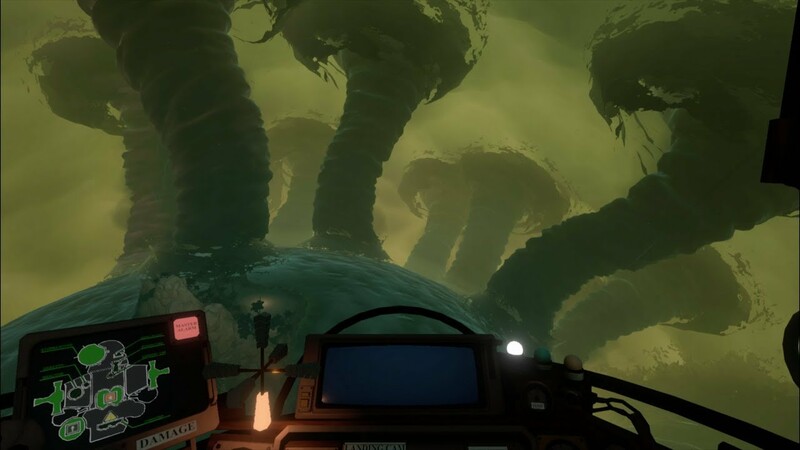 For example what if they add a massive Kraken that becomes another threat that forces players to keep an eye out on the seas as they may end up going near one. What about their own version of Davy Jones with a ship that also can come out from under the water to fight or what about NPC famous pirate crews with larger ships that move around through the game and players can take them on. All possibilities. 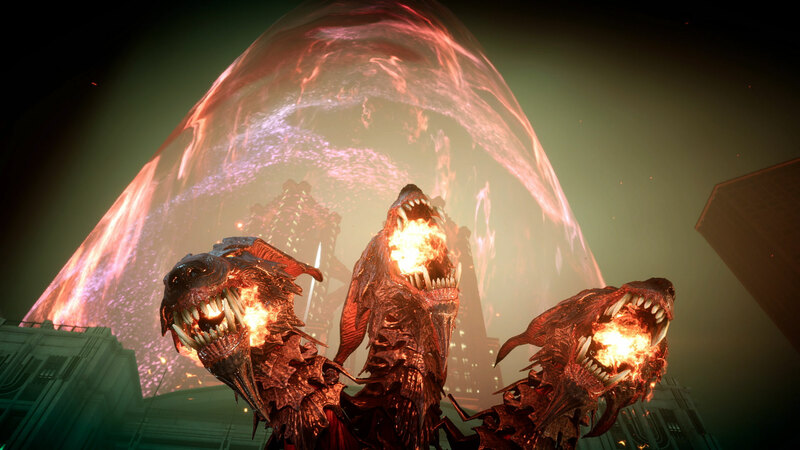 Final Fantasy XV isn’t done yet. Not at all because Final Fantasy XV Royal Edition is coming out 6th of March 2018 on the Xbox One and PS4. The developer of Royal Edition is off course, ‘Square Enix‘. This edition is actually jammed packed. Let’s take a look. One thing that is for sure about Final Fantasy, well the latest games, is that they have awesome graphics. We believe they have the best graphics and visuals. They continue to show this, especially in Final Fantasy XV. Now Royal Edition isn’t a new game. It’s basically an improved version but has much more to offer. If you are Final Fantasy fan, then you definitely have to check this out. Off course when you buy Final Fantasy XV Royal Edition you will get the actual game. You will also receive lots of DLC content like Ragalia car skins, item sets and weapons. 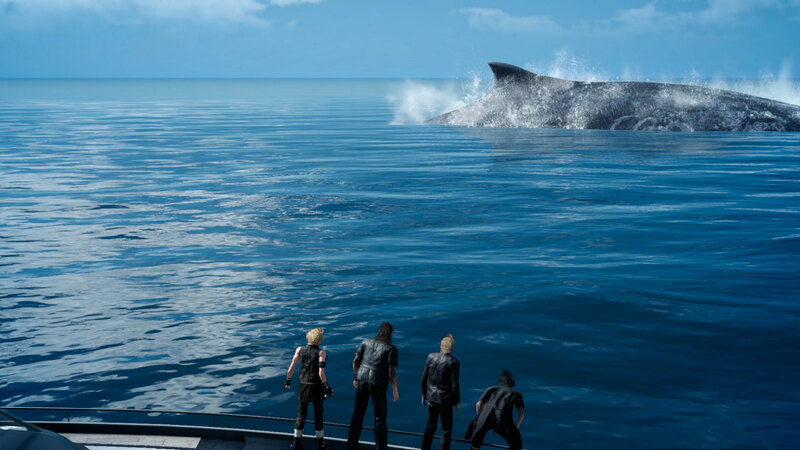 You will also receive complete control of the Royal vessel, that boat in Final Fantasy XV; in addition players can freely explore the large body of water located between Altissia and Cape Caem. It gets better. There is an brand new dungeon available for players to take on. It’s called ‘Insomnia City Ruins: Expanded Map’. So go check that out. But wait! There’s more! Final Fantasy XV Royal Edition also includes all season pass content. That’s right. This means: Episode Prompto, Episode Gladiolus,Episode IgnisandMultiplayer Expansion: Comrades.Now Royal Edition sounds more than worth it but it gets even better. Armiger has been unleashed. 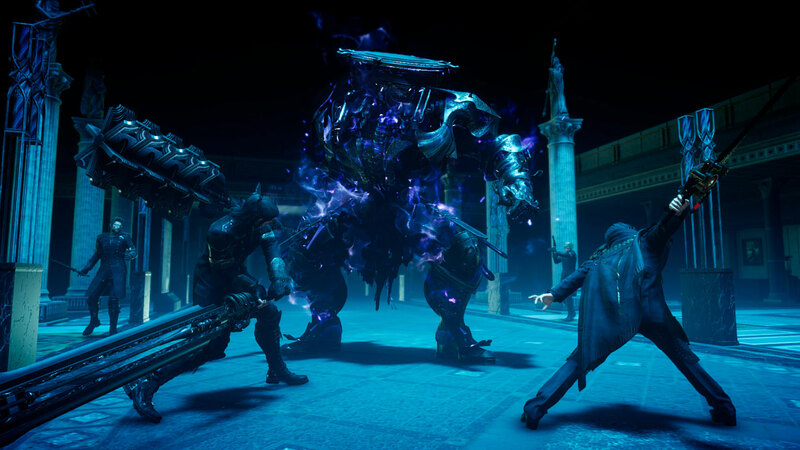 After collecting all 13 royal arms, players will unlock a more “action-oriented mode of the Armiger”. So if you thought all that warping around and weapon variety was action enough, you haven’t seen anything yet. Final Fantasy XV Royal Edition takes things further. This edition also includes new gear, new bosses and a first person mode. First person mode! In Final Fantasy XV! It makes you wonder how that will work. Like would it be the whole campaign and everything is first person or will the first person mode be available only at specific parts like in fights and boss battles? Or maybe it’s the opposite and the first person is only available for the open world parts and exploration. We will have to wait and see. This certainly changes up how the game is played. What if this first person mode leads to VR in the future. Who knows? Now some gamers never see the point in getting certain editions of games and we understand in some cases. Some editions have the same high price but all that’s new is like a few levels and some skins which isn’t worth what they are charging. This edition though… has jammed packed this thing. All season pass content, new features, a new vehicle, more bosses etc. All for $49.99 or £36 (rounded up) if you pre-order. If you haven’t gotten the game before, this is the edition to start with. 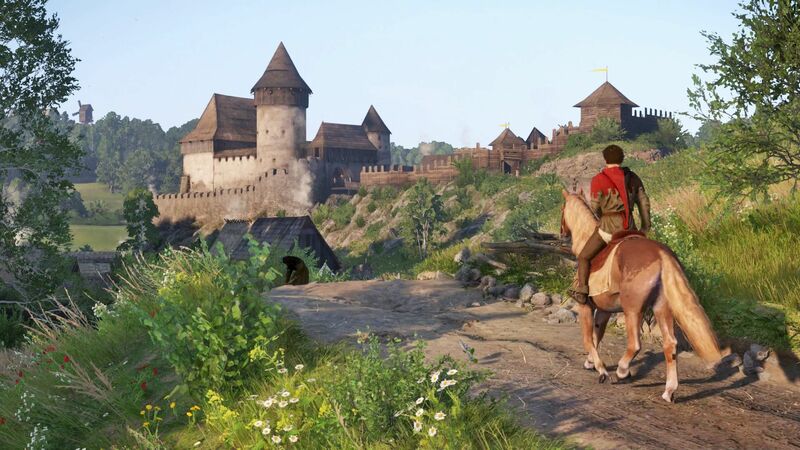 Kingdom Come: Deliverance is a new open world RPG developed by ‘Warhorse Studios’. It’s coming out the 13th of February for the Xbox One, Play Station 4 and PC. 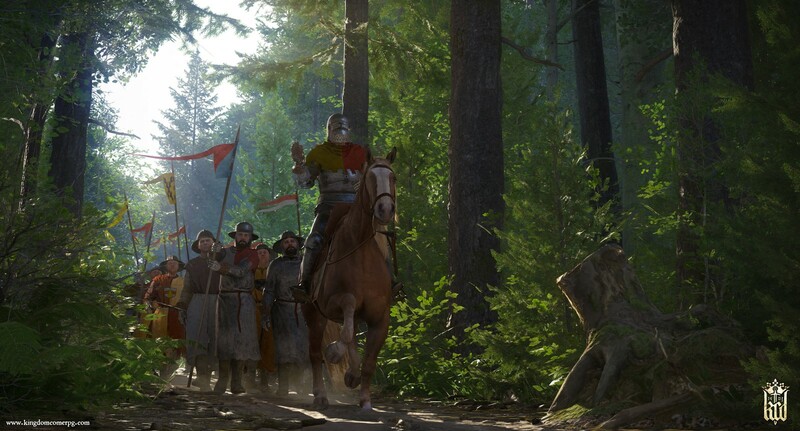 In Kingdom Come: Deliverance players are thrown into the world and times of the roman empire. swords, shields and lots of yelling. Let’s take a look. In Kingdom Come: Deliverance, you play Henry who’s the son of a blacksmith. Henry has a peaceful life but that all got ruined when a mercenary raid shows up. Your village is destroyed and burned to the ground. this raid was ordered by king Sigismund himself. Let’s get some of the back story. This all takes place in Europe 1403, in a region called ‘Bohemia’ which had everything going for it. It was had money rich culture and structures everywhere like castles. Bohemia’s beloved ruler, Emperor, Charles IV died. Basically one of the Emperors sons, Wenceslas took over the throne but was’t as good as Charles was. Then Wenceslas’s half brother, king Sigimund takes action, kidnaps Wencelas and takes over the place. This off course is bad. With no where to go, family ruined and off course some sort of vengeance in your heart, you end up in the service of Lord Radzig Kobyla who just so happens to be forming a resistance to combat and fight against the invaders. Now you, Henry, the player are now in the middle of a very bloody civil war. Bohemia needs an hero. Fight and do your best. It certainly won’t be easy. The enemy isn’t a rage tag group of soldiers, they now how to wield a sword as well. Don’t forget that. The developers wanted to make sure that gamers had as many options as possible about how you do things in the game. Use your reputation and charisma to your advantage. Maybe get some residents or characters on your side or get what you need from them. So your responses, words and what you do with certain individual characters and who you impress will definitely matter. So how will you handle your situations? Handle with your words and very polite or will you use force, raise your sword and make them hand it over. It’s up to you. Just don’t forget that freedom of choice is the main thing about this game. There are many ways to complete a quest and it’s up to the player how you do it but never forget that whatever you do will have consequences. Kingdom Come: Deliverance also payed attention to some smaller details as well. The developers wanted to make this game very realistic as well. NPCs in the game will react to what you do, even if that means reporting you to the authorities. So snitching is a real thing here. There are actually weather patterns in Kingdom Come: Deliverance so rain, probably fog as well. That sounds real cool. It gets better though. There is a functioning day and night system. This is awesome. It adds more layers to the game. You could attack at night in the rain. Or wait for a sunny day. We checked out some gameplay and we can confirm that this won’t be a hack and slasher at all. Each fight will require players to use their head and have good timing. Wait for an opening and then exploit it. It’s all European sword fighting. Wield many weapons like swords, maces, off course axes and more like the bow and arrow. Join large battles with many soldiers yelling and swinging their swords and even help with castle sieges. The action is far from dull. It’s definitely something you should check out for yourself. The 1v1 fights can go so wrong very quickly so have the right armour and don’t rush.